I first came across the concept at Skinnytaste, and you guys, my mind was BLOWN. 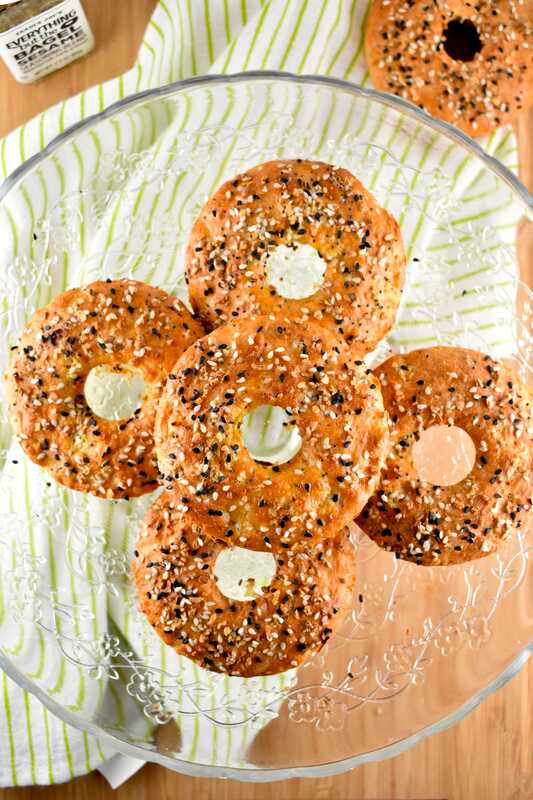 Gina Homolka at Skinnytaste, used the dough to make the most lovely, no-fuss, no-boil, super easy to make bagels that came out to just 3 Points! I was sold. A little online research led me to an avalanche of two ingredient dough recipes, and I was beyond excited to give this a try! I love bagels. Like seriously, LOOOOOVE bagels. They are my kryptonite. I just cannot pass them up. But they are typically very high in Points, so I avoid them. Like the plague. Because I have little self control, and know that I simply cannot be trusted around bagels. And it’s sad, because bagels are soooooo good, but I feel guilty eating them. And they use up too many of my precious Points! That’s why I got beyond excited when I first found out about the 2 Ingredient Bagel Recipe, and I couldn’t wait to give it a try myself and share it with all of you! Are you excited about this yet? First, let me point out that there are definitely some variations to this recipe out there. The original two ingredient dough recipe does use just two ingredients – self-rising flour, and plain Greek yogurt. If you have some self-rising flour on hand, you’re good to go. But I rarely bake, so I typically only have whole wheat all-purpose flour on hand. Therefore, the two ingredient bagel recipe that I used, actually has a couple other ingredients so that I could basically make my own self-rising flour. Which technically makes it not a 2 ingredient bagel recipe, but I’m a rule breaker, and you can forgive me, right? Don’t worry though…the extra ingredients are very basic, and you most definitely already have them on hand in your kitchen right now. I know you are going to be PUMPED to make these bagels, so I’m not going to send you out to the store to purchase more ingredients. Another thing I love about this recipe is how INCREDIBLY easy it is. It doesn’t even involve boiling!! While these do taste a lot like traditional bagels, they are not, and I didn’t expect them to be. But, they do taste similar, and are surprisingly very good. Much like traditional bagels, they do have a chewy, thicker exterior, and a chewy, airy interior. But they don’t expand as much as regular bagels do, so expect them to be a bit on the smaller/personal size. To make it easier, and because I wanted my bagels to all be uniform in their shape, I used a silicone bagel mold. If you don’t have one, you can just roll the dough into “snakes” and then connect them together at the ends to create your bagel shape. As for toppings, my favorite is Trader Joe’s Everything But the Bagel Sesame Blend. But you can use just about anything you’d like. I did use an egg wash before adding my topping. I’ve seen it done successfully without the egg wash, but I like the texture and color it adds, so I prefer to use it. 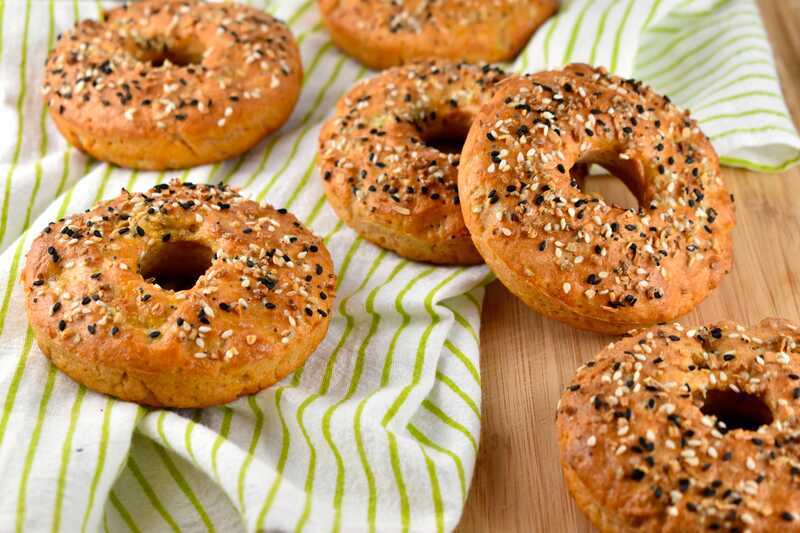 Fresh, homemade bagels that don’t require any yeast, proofing or boiling! 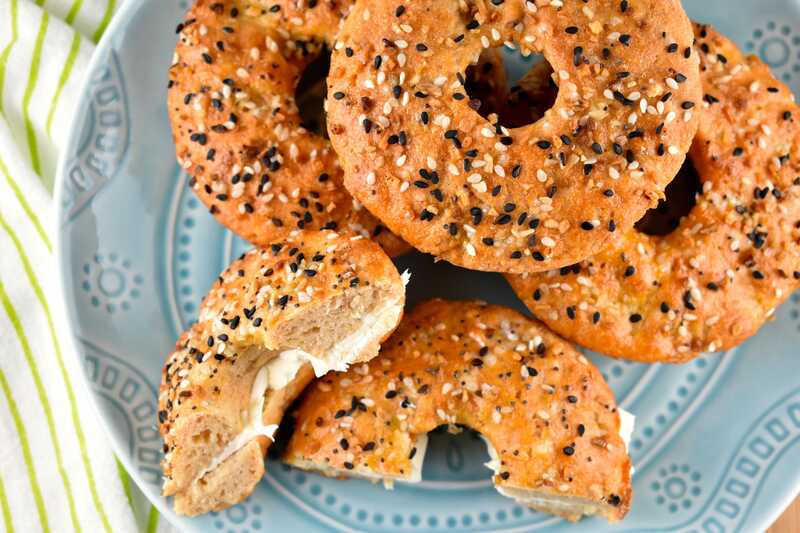 You can make warm, soft chewy bagels in less than an hour. Preheat oven to 375 degrees, and line a baking sheet with parchment paper and mist with cooking spray, or use a silicone bagel mold and mist with cooking spray. In a bowl, combine the flour, baking powder and salt. Whisk well. Then, using a spatula, fold in the yogurt, and mix well, until the dough begins to look like crumbles. 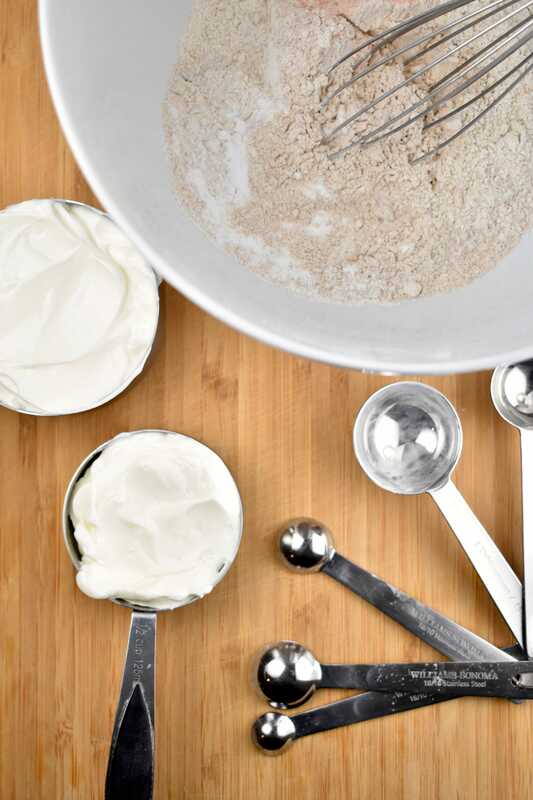 Lightly dust a countertop surface or large cutting board with flour. 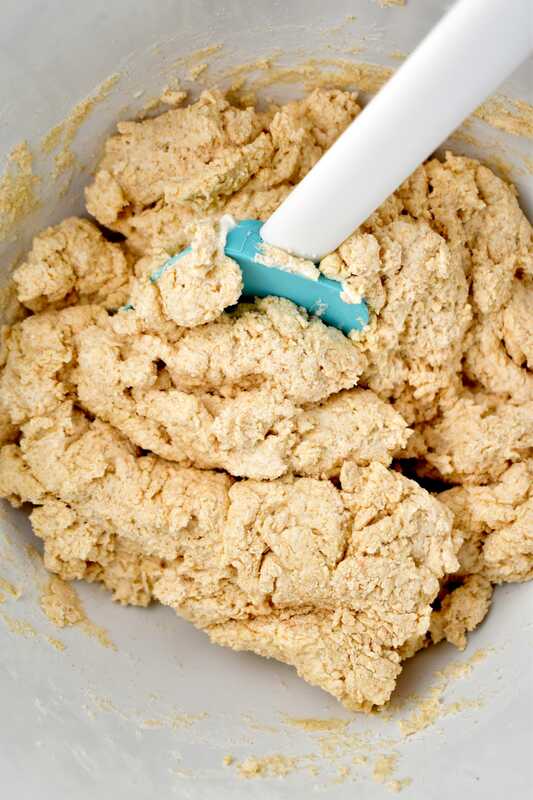 Transfer dough to the floured surface, and knead and turn the dough, using hands, until it is well combined and no longer sticky. 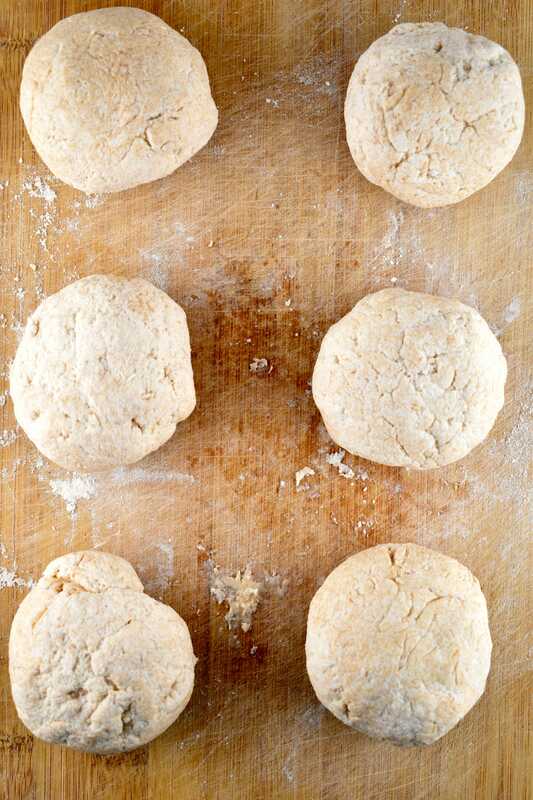 Divide dough into 6 equal parts. Using your hand, roll each segment into ropes, and join them at the ends to form bagels. 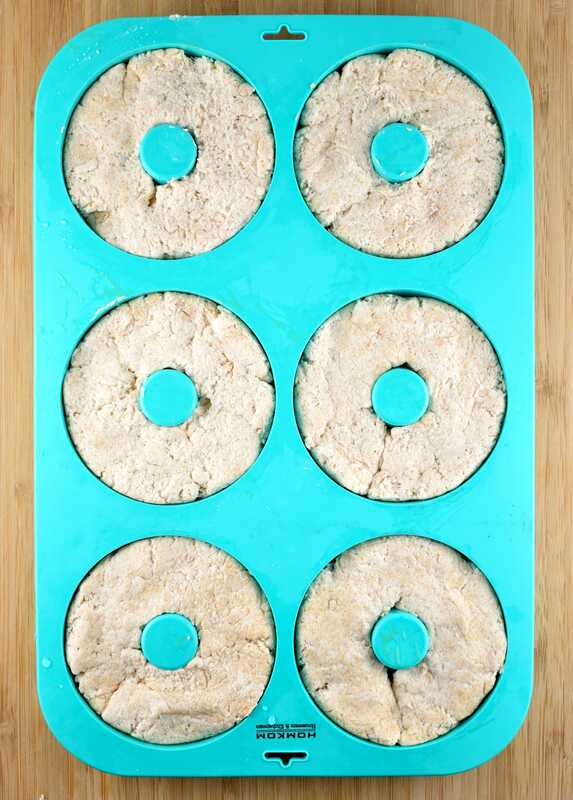 *If you’re using a bagel mold, just press the dough into each mold. 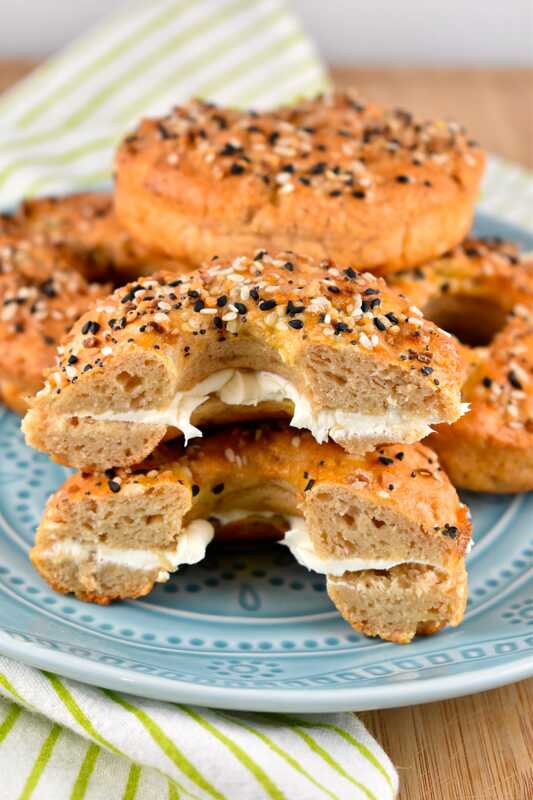 Brush each bagel with an egg wash, and sprinkle with desired toppings. Bake for 25 minutes, then remove from oven and allow to cool for 8-10 minutes. help, I have tried this 4 times with self rising flour and low fat greek yogurt. what could be easier andi yet I can never get beyond major sticky dough. I keep adding flour and even with more than ½ cup extra, still too sticky. the more I knead, the stickier it gets. Never ever gets to crumbly. I do measure the flour as I do for other baking, lightly spooning into measuring cup and then leveling. I even tried 2 ingredient pizza dough and had to throw it out. Hi Susan! I’m so sorry you’re having problems with this! The only thing I could suggest, is that maybe the type of yogurt you are using is too runny? Some non-fat and/or low fat yogurts can be very watery. I prefer using 0% Fage, because it’s so thick and fluffy, and not at all runny. Maybe that will help?